On Christmas Eve, a little girl named Ollie meets one of Santa’s reindeer. Ollie seems to be a big fan of reindeer, as she wears a furry reindeer costume to bed and sleeps with a stuffed reindeer toy. When she hears the sound of jingle bells late on Christmas Eve, Ollie goes outside alone with her sled to find the source. She finds a red collar with shiny, silver jingle bells and then meets a reindeer looking for the lost collar. 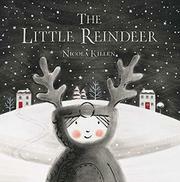 Her new reindeer friend takes Ollie for a thrilling ride through the starry sky before delivering her home and rejoining the reindeer team for Christmas Eve deliveries. On Christmas morning Ollie finds her present from Santa, a snow globe with a tiny replica of her reindeer friend inside. Delightful illustrations in a muted palette of grays are enhanced with touches of deep red and shiny silver that stand out against the snow. Ollie’s surprising ride on the reindeer’s back is enchanting, shown in a wordless double-page spread with shiny jingle bells and a swath of silvery dots indicating the magical nature of reindeer flight. Subtle surprises include matching patterns on Ollie’s bed quilt and the reindeer’s saddle blanket as well as occasional, cleverly designed die-cut windows that offer a glimpse of the following page. Ollie and Santa are both white.